I have experienced many large cigars over the last three decades, and without further ado, here are the biggest cigars that I have ever personally seen or smoked. Although both of these cigars were considered to be "smokable", let's face it, they are nowhere close to being practical. 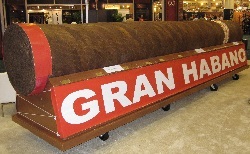 The Gonzalez Habano rolled by Wally Reyes at the Tampa Cigar Heritage Festival in 2006 was 101 feet long, which broke the Guinness record for the world's longest cigar. However, that record was broken again several times after 2006. The current record is 268 feet and 4 inches, for a cigar made in Cuba by Jose Castelar Cueto in May 2011. The Gran Habano El Gigante has a ring gauge in excess of 2,500. This cigar was displayed at a number of venues, including the IPCPR Trade Show in New Orleans during 2010. The cigar sold for $185K in 2013. The Dignity Smoke of Art Cateva Limitada Serie 1944 (pictured top right) is a Diadema shaped cigar measuring nine inches in length with a ring gauge of 55. I reviewed this cigar for About.com back in 2013, and rated it with 3½ stars overall. However, the cigar's medium body and naturally sweet tobacco flavor were very enjoyable at the beginning, but eventually declined to the point where I stopped smoking it after one hour, with five inches still left. In addition to being long, the cigar is also distinguished by its artistic band and "eco-friendly" blend of Costa Rican tobaccos. The latest version of this cigar is called the SOA Las Vacaciones Diadema, which is now 9½ inches long. The artwork on the band has also changed. Only 1,000 of these limited edition cigars are produced annually. The Asylum 13 Eighty is a cigar that measures six inches in length, but with a ridiculous ring gauge of 80! This is a cigar that I would not buy for myself, but was received as a gift from one of my old cigar mentors, Mr. Steve Duvall. When this cigar was introduced in 2013, my former About.com colleague, Dr. Mitch Fadem, challenged me to smoke one. At that time, I told him "no way". However, I eventually took the plunge on Super Bowl Sunday back in 2015.